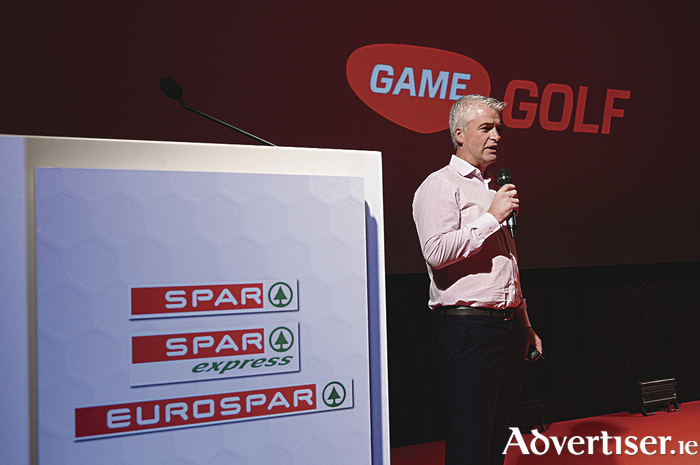 Galway man and successful entrepreneur John McGuire, CEO and Founder of Active Mind Technology, creator of a real-life digital sports platform spoke at the recently-held SPAR EUROSPAR Convention at The Europe Hotel and Resort in Killarney. The event, which was themed ‘Fresh Focus’ saw hundreds of retailers who represent approximately 450 SPAR, SPAR Express and EUROSPAR stores throughout the Republic of Ireland, gather to hear from a high profile line-up of local and international guest speakers including John McGuire, Philip Moynagh, Founder and CEO of Growtiply.com; Robin Banks, International Mind Power Expert; Tobias Wasmuht, Managing Director, SPAR International and Olympic silver medallists and home grown heroes, Gary and Paul O’Donovan. Mr McGuire who is originally from Corofin and now resides in Silicon Valley, California is the creator of Game Golf, a digital product for athletes and sports enthusiasts who want to see, share, compete and compare their game with pros and peers. US President Barack Obama is among a number of high profile names who use Game Golf in order to track their golf progress. Mr McGuire worked both as a software engineer and in the field of sports psychology before going out on his own and starting Active Mind Consultancy, his sports psychology practice before finding success with his company Active Mind Technology in Silicon Valley. He told the audience at the SPAR EUROSPAR Convention how he moved to San Francisco in 2010 with just self-belief and determination in order to progress his idea. As a youngster, Mr McGuire played football for Corofin GAA and attended school in Ballinderry National School and secondary school in St Pats, Tuam. He went on to study a BTech (Bachelor of Technology ), specialising in Big Data in the University of Limerick. BWG Foods, owners and operators of the SPAR, SPAR Express and EUROSPAR brands in Ireland, used the Convention to announce plans to grow overall store numbers by 20 stores in the next 12 months.